The ability to write—to clearly convey ideas, thoughts or concepts—is frequently underestimated in investment banking. Over the years, I’ve seen thousands of investment banking analysts come and go, and their ability to provide written commentary for a pitchbook or presentation is one thing that always set them apart. The best way to improve your writing is to write. It’s like a muscle and needs to be continuously flexed. Unfortunately, over the past decade, requiring junior bankers to do their own writing has become a lower priority, which could have grave consequences for the industry. In my early analyst days, I remember taking it upon myself to fill in the blanks of a pitchbook. It was the first pitchbook I worked on, and as I filled in the headers, subheaders, commentary, and even the keynotes, I felt like I did a pretty good job. My Managing Director disagreed. When I received his marked-up version the following morning, each page looked like it was bleeding to death, covered in so much commentary, edits, and notes that he must easily have run through at least three pens. Although demoralizing, it was valuable, and I took each piece of advice as gospel, focusing on learning and perfecting the style of the Managing Director. After all, he had reached the top of his industry while I was just beginning, so I was happy to learn. Soon enough I moved to a different senior banker for a new project. And, as any junior banker will confirm, it was back to square one regarding learning style and copy preferences. This pattern continued over the next five or so years, which sounds painful and repetitive, but I consider myself fortunate to have been able to learn from such a (mostly) great group of bankers. This continuous learning led to the emergence of my own personal style. And, while it may not have exactly matched that of whichever senior banker I was working with, it was strong enough to stand on its own. My pages stopped looking like they had an encounter with Freddy Krueger and started to come back relatively clean. I believe that if I hadn’t been given these opportunities, I wouldn’t have grown as a banker. In turn, I’m always cognizant of providing these opportunities to my team. But this seems to be less common. On the one hand, I can sympathize; junior bankers are less likely to stick around, and if you’re cycling through bankers every few years, is it worth the time investment? But not paying attention or not investing effort in developing the writing skills of the next generation of bankers will come at a cost. Some of those bankers you may be neglecting will stick around. Are we setting ourselves up for an industry filled with vice presidents who aren’t proficient at drafting a pitchbook? Once, a senior banker told me that he didn’t trust millennials bankers to write a pitchbook. His argument was that they were so used to tweeting, hashtagging, and so forth that their informal and shortened style of writing would “infect” the pitchbook. This isn’t true. Yes, junior bankers (and the rest of the world) may write a particular way on social media, but this is adjusting their writing style to a different audience and platform (something that helps develop writing skills) not a representation of their writing skill. Plus, most social media posts rely on short, quippy statements that share an idea or mood. Sound useful? As I wrote at the beginning of this post, the best way to practice writing is to write and tweeting counts. Investment banks are always happy to allow junior bankers to do the data collating, the number crunching, and the visualization creation, but these activities can’t happen at the expense of learning how to interpret and analyze information in writing. To hand a fully-drafted pitchbook to a senior banker, a junior banker needs to master two skills (both used to be expected of second-year analysts). Interpretation of financial analysis: Perhaps the most important to bankers for their future career, mostly because if this is missing, a banker can’t progress to the next level. Anyone can graph a couple of numbers onto a page, but only someone adept at financial interpretation can explain what it means to clients. Written storytelling: Ask any first-year analyst to draft commentary for a pitchbook, and it will be amazingly factual but lacking any pizzazz. 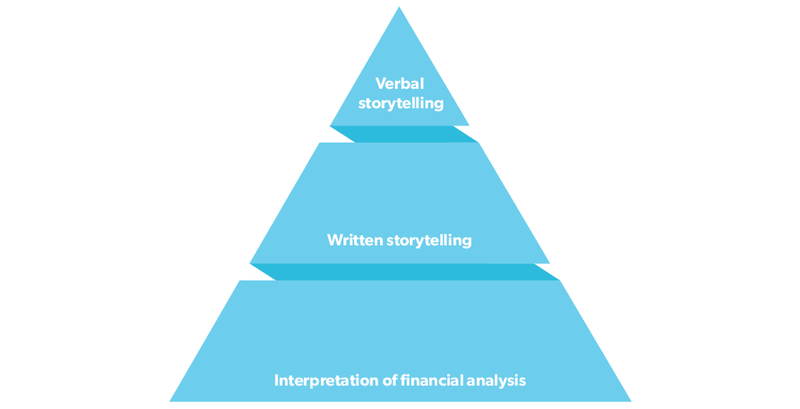 Once someone knows how to interpret financial analysis the next step is to build the skills that shape it into a narrative. And working with senior bankers is the quickest way to develop this talent. I consider it as a skills pyramid. Too often, once someone is promoted to Vice President, they are expected to jump right to the top of the pyramid—able to go off script with a client. But if they are missing the more fundamental skill of writing they are set up to fail. This needs to change. Over the next few years, I would love to see some improvements to give junior bankers have a greater chance of becoming a stellar senior banker. Apprenticeship: Senior bankers need to provide junior bankers with the opportunity to draft pitchbooks. Senior bankers also need to give continual feedback. Mock presentations: Often part of early onboarding training. In a mock presentation, the junior banker plays the role of senior banker—it’s their presentation and their interpretation. I’d love to see junior bankers presented with a pitchbook of data but no words and be tasked to bring the story to life, both written and verbally. These sessions should happen frequently—I’d go as far as once a month—involving both junior and senior bankers. Look for writing: When recruiting, consider the quality and breadth of the incoming class’s writing experience. If you’re a junior banker, let me know how you think an increased emphasis on writing would impact your career at adrian.s.crockett@gmail.com. And if you’re a senior banker, while there were probably rough moments as you established your banking career, I bet there were also plenty of people who provided guidance and mentorship. Be a mensch, pay it forward. Junior bankers, do you know your optimal stopping point?